There is a vitally important reason designing the HVAC for a natatorium is standard practice for our dehumidification systems and part of our Design Guidelines for Indoor Pools. A properly designed air delivery/duct work system for the pool room environment is extremely critical to the overall integrity of the enclosure. It prevents condensation, reduces humidity, alleviates deterioration, and ensures the pool dehumidifier works at maximum dehumidification potential for the system. Our boast about building the best dehumidification equipment has one caveat. No amount of engineering the equipment can make up for poorly designed or inadequate air flow! In our decades of real world pool room environments, we have experienced ASHRAE minimum standards that can and do fail. It’s pretty much guaranteed you’ll need to exceed those standards. Fiberglass duct liner should not be used. Where condensation may occur the insulation must be applied to the exterior of the duct. Duct materials and hardware must be resistant to chemical corrosion from the pool atmosphere. Grilles, registers and diffusers should be constructed from aluminum. Supply air should be directed against interior envelope surfaces prone to condensation (walls, glass, and doors). Total airflow should be determined by a psychometric analysis. Most codes require a minimum of six (6) air changes per hour (commercial), except where mechanical cooling is used. This rate may prove inadequate for some anticipated conditions of occupancy and use. Where mechanical cooling is provided, air delivery rates should be established to maintain appropriate conditions of temperature and humidity. DXair custom builds each natatorium dehumidification system to effectively control humidity. 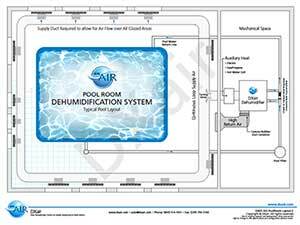 To truly achieve that humidity control with our pool dehumidifiers, we’ve found that providing the necessary shop drawings for the air delivery system as part of our consulting and engineering package will ensure the proper HVAC system is installed. We equate the dehumidifier to a “heart” and the duct work system as the “arteries” for a healthy pool room environment. One simply cannot work without the other. The “great heart”, “bad artery” syndrome has been problematic with indoor pools for decades. That is resolved with good design! The beauty of it is we work seamlessly with mechanical firms. Your ultimate goal as a mechanical contractor, architect, engineer, or anyone else involved in the construction or renovation of a natatorium is client satisfaction. We’re not shy about emphasizing the fact that misinformation prevails in this industry, but you’ll appreciate that your goal of client satisfaction is being achieved by partnering with us to help make it happen. If you’re reading this page, it has to be because you haven’t worked with us yet. Otherwise we’d be your first call. We encourage you to call. One of the things that surprises a lot of people is the fact that a real human being answers whenever possible.